Minions love trouble so it is only natural that they show up in a Despicable Me edition of the classic called “Trouble”. The whole point of the Trouble board game, regardless of edition, is for each player to move their pieces all around the board by rolling, or in this instance, popping dice. Players are assigned four games pieces of the same color and the object of the game is to be the player that moves all of his four pieces around to the “Home” space before any other player. Instead of rolling the dice with your hands, they are placed in a “Pop-O-Matic” popper, that with the push of a domed lid, rolls the dice for you. This keeps the dice on the game board and out of your plants, furniture, carpet and the dog’s mouth. In this Minions Despicable Me Trouble board game, the Minions must move around Gru’s conveyor belt and make it to the safe set of “Finish Steps”. Siren “Bob” (Bee-Do Minion Carl is on the box) whose image is on the dice, makes a player safe from getting sent home if he is rolled. If a subsequent player happens to roll “Siren Bob”, then the previous player is no longer safe. What’s Included with the Minions Trouble Game? This game is recommended by the manufacturer for ages 5 and older because it contains small pieces that may pose a choking hazard. It is officially licensed Despicable Me merchandise that has been made outside the US and is imported. Those familiar with the original “Trouble” game will remember that the game board itself was plastic and provided a sturdy surface for popping the dice and moving game tokens. 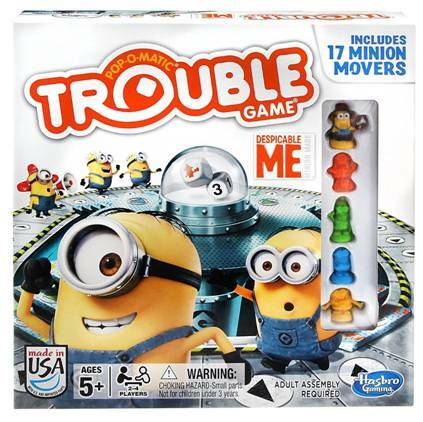 It should be noted that this Minions Edition Trouble game board is cardboard. This game is best played on a hard surface like a tabletop or a hardwood, vinyl or tile floor. This game is not well suited for playing on the couch, on top of a bed or on carpet because the cardboard base cannot support the deflection in softer materials. Pricing has been determined by the supplier and not this Despicable Me review site. Still, for the price, this is inexpensive entertainment guaranteed to keep a child engaged while providing a few benefits along the way, like taking turns, counting and enhanced memory through repetitive action.